The aim of this study was to compare between small-caliber catheter rapid pleurodesis and conventional chest tube pleurodesis as regards efficacy and hospital stay in patients with malignant pleural effusion (MPE). Chemical pleurodesis can be palliative for recurrent, symptomatic pleural effusions in patients who are not candidate for a thoracic surgical procedure. We hypothesized that pleurodesis as effective as the standard method could be accomplished with a rapid method of pleurodesis. This prospective randomized controlled trial included 30 patients with MPE. Patients were divided into two groups: group A, which underwent rapid pleurodesis with a small-caliber tube (8–14 Fr), and group B, which underwent conventional pleurodesis. Talc was the sclerosing agent that was used. The small-caliber tube was inserted under local anesthesia with total evacuation of pleural fluid, maximum 1.5 l, followed by gradual evacuation. Rapid pleurodesis was performed only after obtaining radiological evidence of complete evacuation of the fluid and the tube was clamped for 1 h. The fluid was drained over 1 h and the catheter removed and the patient discharged. The chest tube was inserted under local anesthesia with total evacuation of pleural fluid, maximum 1.5 l, followed by gradual evacuation. Pleurodesis was performed only after obtaining radiological complete evacuation of the fluid, daily drainage of less than 300 l. The tube was clamped for 1 h. The fluid was drained over 6–12 h and the tube was removed and then the patient was discharged from hospital. Our study included 15 patients in group A who underwent rapid pleurodesis and 15 patients in group B who underwent conventional pleurodesis. There was a significant difference between the two groups as regards hospital stay and postoperative pain. Small-caliber tube drainage and rapid pleurodesis were shown to be efficient and demonstrated a good safety profile in treating MPEs. A pleural effusion is defined as a malignant pleural effusion (MPE) with the presence of malignant cells in the pleural fluid and an increase in the volume of pleural fluid. MPEs occur in patients with advanced malignancies and are most commonly associated with lung, breast, gastric, and ovarian cancers as well as lymphoma . MPEs represent 22% of all pleural effusions, and, in 20% of these patients, MPE is the first clinical presentation of their malignancy . A MPE is an ominous clinical indicator and represents advanced stage neoplasm. The prognosis of patients affected with MPE is usually poor with a reported median survival of 6 months . MPEs are most often characterized chemically as exudative pleural effusions. There are numerous mechanisms in which a malignancy can contribute to the formation of an MPE. In many cases, the malignancy causes inflammation, subsequent increased pleural permeability, and enhanced production of pleural fluid resulting in the accumulation of an effusion. Malignancy can also impair the pleura through direct pleural invasion resulting in an increased pleural effusion. If the mediastinal lymph nodes are involved, the pleural lymphatic drainage system will be impaired, decreasing outflow and resulting in increased fluid accumulation . The management of patients with MPE is cumbersome and can present important diagnostic and therapeutic challenges . Several palliative treatment options are available, including therapeutic thoracentesis, tube thoracostomy, small-caliber tube, chemical pleurodesis, video thoracoscopic pleurodesis, and pleuroperitoneal shunt . Pleurodesis is performed to inflame the visceral and parietal pleura to fuse the pleurae together, thus obliterating the potential pleural space . However, various factors have impact on the success of pleurodesis, including initial drainage time, chest drain diameter, and management of the chest drain (suction and no suction) . Traditional catheter drainage of MPE includes tube insertion, either large-sized or small-sized tube, daily observation, and pleurodesis if daily drainage is less than 200–400 ml, and re-expansion of the lung is provided. However, this approach may lead to very long hospitalization time with limited success of the procedure . Rapid pleurodesis can lead to fast palliation without the need for hospitalization in most patients. The technique aimed at full evacuation of pleural fluid and total radiological lung inflation. Subsequently, pleurodesis is carried out, and then the tube is removed and the patient is discharged . The aim of this study was to compare between small-caliber catheter rapid pleurodesis and conventional chest tube pleurodesis as regards efficacy and hospital stay in patients with MPE. 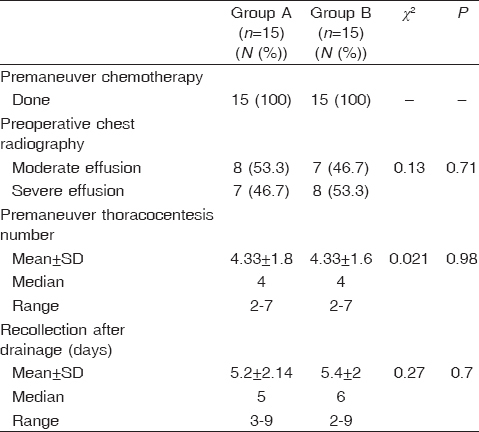 This prospective randomized controlled trial included 30 patients in Menoufia University Hospital with MPE who were divided into two groups: group A, which underwent rapid pleurodesis with small-caliber tube (8–14 Fr), and group B, which underwent conventional pleurodesis with conventional chest tube pleurodesis (28–34 Fr). Talc was the sclerosing agent that was used in both groups. Thirty patients with MPE were included in this study. Written informed consent was obtained from each patient before his or her enrollment in the trial and approval was obtained from Menoufia University Hospital. All patients with a diagnosed symptomatic MPE with previous trials of thoracocentesis and reaccumulation were included in this study. However, patients with trapped lung, infected pleural effusion, congestive heart failure, renal failure, or decompensated liver cell failure were excluded. The severity of pain was detected according to numeric pain score, which ranged from 0 to 10. The small-caliber tube was inserted under local anesthesia with total evacuation of pleural fluid, maximum 1.5 l, followed by gradual evacuation. Rapid pleurodesis with 5 g talc slurry through small-caliber tube was performed only after obtaining radiological evidence of complete evacuation of the fluid and no-trapped lung in chest radiography (CXR). Computed tomography of the chest may be ordered when required if CXR was not conclusive. The tube was clamped for 1 h. The fluid was drained over 1 h, and then the catheter was removed and the patient was discharged. The chest tube was inserted under local anesthesia with total evacuation of pleural fluid, maximum 1.5 l, followed by gradual evacuation. Pleurodesis with 5 g talc slurry was given through the catheter only after obtaining radiological evidence of complete evacuation of the fluid, no-trapped lung, and daily drainage of less than 300 ml. The tube was clamped for 1 h. The fluid was drained over 6–12 h, and then the tube was removed and the patient was discharged from hospital. All patients were followed up in the outpatient clinic at 1 week, 2 weeks, and 1 month from discharge date and subjected to plain CXR to evaluate the efficacy of pleurodesis and the degree of procedure success. Computed tomography of the chest may be ordered when needed. Data were statistically analyzed using statistical package for the social science program, version 13 (IBM Corp. Version 20.0. Armonk, NY), for Windows and for all analyses a P value less than 0.05 was considered statistically significant. Data were shown as mean, range, or value and 95% confidence interval and frequency and percent. The χ-test was used for qualitative variable analysis and a P value less than 0.05 was considered significant. The Mann–Whitney test was used for quantitative variables that are not normally distributed and a P value less than 0.05 was considered significant to present the results. This study was carried out on 30 patients with MPE who were divided into two groups: group A, which underwent rapid pleurodesis with a small-caliber tube (8–14 Fr), and group B, which underwent conventional pleurodesis. Talc was the sclerosing agent that was used in both groups [Figure 1]. Figure 1: 30 patients with malignant pleural effusion in which it was divided into two groups. Rapid pleurodesis with small caliber tube (8-14 Fr) (group A), conventional pleurodesis (group B).Talc will be the sclerosing agent that will be used in both groups. Group A included three (20%) male and 12 (80%) female patients, and group B included four (26.7%) male and 11 (73.3%) female patients. Their ages ranged between 40 and 66 years in both groups, with a mean ± SD of 54.27 ± 7.7 in group A and a mean ± SD of 52.2 ± 8.4 in group B [Table 1]. Out of the 30 patients, the most common site of primary malignancy was the lung; the incidence was 46.7% in group A and 53.3% in group B. The second common primary malignancy was breast cancer [Table 2]. Dyspnea was the leading symptom noticed in 15 (100%) cases in the two groups. Chest pain was present in 46.7% of patients in group A and in 60% of patients in group B. Cough was present in 60% of patients in group A and in 53.3% in group B [Table 3]. Premaneuver chemotherapy showed no difference between group A and group B as it was performed in 100% of patients in the two groups. Preoperative CXR was performed to diagnose and determine the amount of effusion, whether moderate or severe. In the two groups, there was no significant difference as 53.3% of patients in group A showed moderate effusion and 46.7% of patients in group B and 46.7% of patients showed massive effusion in group A compared with 53.3% in group B [Table 4]. Cytology performed in pleural fluid analysis was positive in 60% of patients in group A and in 46.7% of patients in group B [Table 5]. As regards postoperative pain in group A, 40% reported no pain, 53.3% reported mild pain, and only 6.7% reported moderate pain; however, in group B, 53.3% reported moderate pain, 33.3% reported mild pain, and only 13.3% reported no pain [Table 6]. As regards postoperative complications, including fever, infection, and allergy to the agent, fever was present in 60% of patients in group A and in 53.3% of patients in group B, infection was not found in any of the patients in our studied groups (both A and B), and allergy to the agent, which was talc in the two groups, was not present in 93.3% of patients in group A and in 86.7% of patients in group B [Table 7]. Hospital stay ranged between 2 and 4 days in group A and between 4 and 9 days in group B [Table 8]. Finally, it was noticed that recurrence occurred in 13.3% of patients in group A and in 20% of patients in group B, which is considered a low rate of recurrence in both groups, and hence it was an efficient procedure to some extent [Table 9]. Although this research was carefully prepared, we are still aware of its limitations and shortcomings. The research was conducted in the two classes and follow-up was for 4 weeks. Four weeks is not enough for the researcher to observe the recurrence. The population of the experimental group is small (only 30 patients) and may not represent the majority. Moreover, it was performed only in one place (Menoufia University Hospitals), and the last limitation was low financial support. The management of patients with malignant and/or recurrent pleural effusions is cumbersome and can present important diagnostic and therapeutic challenges. Pleural effusion causing symptoms such as chest pain and dyspnea is a common problem that causes significant morbidity and can negatively affect the quality of life of patients for their remaining months . Despite management of underlying malignancy with chemo/radiotherapy, MPEs may persist or recur and necessitate palliative interventions to control or alleviate the symptoms. Several palliative treatment options are available, including therapeutic thoracentesis, tube thoracostomy, chemical pleurodesis, video thoracoscopic pleurodesis, and pleuroperitoneal shunt . Pleurodesis is performed to inflame the visceral and parietal pleura to fuse the pleura together, obliterating the potential pleural space. Pleurodesis with sclerosing agents has a high success rate but requires hospitalization for up to 6 days until chest tubes can be removed. It is generally considered standard treatment for recurrent MPE. Asbestos-free talc has been established as the most effective agent for pleurodesis. However, various factors have impact on the success of pleurodesis, including initial drainage time, chest drain diameter, and management of the chest drain (suction, no suction). Success and length of stay of the patients (5–7 days) are of utmost importance as patients with MPE are usually critically ill and/or moribund. In these patients with an expected survival of only 8 months, the aim of a palliative intervention should be a reliable alleviation of dyspnea, improving quality of life, shortening hospital stay as much as possible, and keeping the duration of chest tube drainage as short as possible . Traditional catheter drainage of MPE includes tube insertion, daily observation, and pleurodesis if daily drainage is less than 200–400 ml, and re-expansion of the lung is provided. However, this approach may lead to very long hospitalization time with limited success of the procedure. We investigated the value and effectiveness of a rapid and pleurodesis method using talc in patients with potentially recurrent pleural effusion. Our secondary hypothesis was whether or not rapid pleurodesis would decrease the length of hospitalization . Our study included 30 patients in Menoufia University Hospital with MPE who were divided into two groups: group A, which underwent rapid pleurodesis with small-caliber tube (8–14 Fr), and group B, which underwent conventional pleurodesis. Talc was the sclerosing agent that was used in both groups. In our study, we noticed that primary lung cancer was the common malignancy in about 46.7% in group A and in 53.3% in group B, but primary breast cancer was the second common malignancy with an incidence of 40% in both group A and group B; similar findings were reported by Özkul et al. . Moreover, the findings were similar to those of Spiegler et al. in which the primary site of malignancy was the lung in 33% and the breast in 30%. However, in the study by Krochmal et al. , breast cancer was the most common malignancy, present in 34% patients, and primary lung cancer was the second most common malignancy, present in 24% patients. As regards receiving chemotherapy in our study, 100% of patients had already received chemotherapy in both groups. The incidence is higher than that reported by Krochmal et al. , who reported that 66% of patients were actively or recently receiving concomitant chemotherapy at the time of the procedure. The postoperative complication was minimal, as in our study only 6.7% had moderate pain and 53.3% had mild pain in group A, but in group B 53.4% had moderate pain and 33.3% had mild pain; it was higher than that in group A. As regards fever in the two groups, there was no great difference as it was present in 60% of patients in group A and in 53.3% of patients in group B. As regards allergy to agent, there was no significant difference between the two groups as allergy was detected in 6.7% of patients in group A and in 13.3% of patients in group B. In the study by Krochmal et al. complications were observed during the procedure. A total of 17% of the patients experienced postprocedural complications. Three patients experienced two or more complications, which included an infection related to the MPE in 7%; one patient required hospital readmission due to pneumonitis and the other was treated for empyema as an outpatient. Both patients improved with antibiotic therapy. Ten percent experienced postprocedural fever. One patient had clog in the TPC and one had acute lung injury from the talc . As regards hospital stay, there was a significant difference between group A and group B in our study, as in group A the mean was 2.8 days and the median was 3 days, whereas in group B the mean was 5.9 days and the median was 6 days. This is nearly similar to the results by Özkul et al. , who compared between two groups and showed a mean length of stay of 2.2 days in group A, whereas it was 9.0 days in group B. In the rapid pleurodesis group the procedure was completed in less than 24 h in 80% of patients in the study by Özkul et al. . In the study by Krochmal et al. the median hospitalization was 2 days. 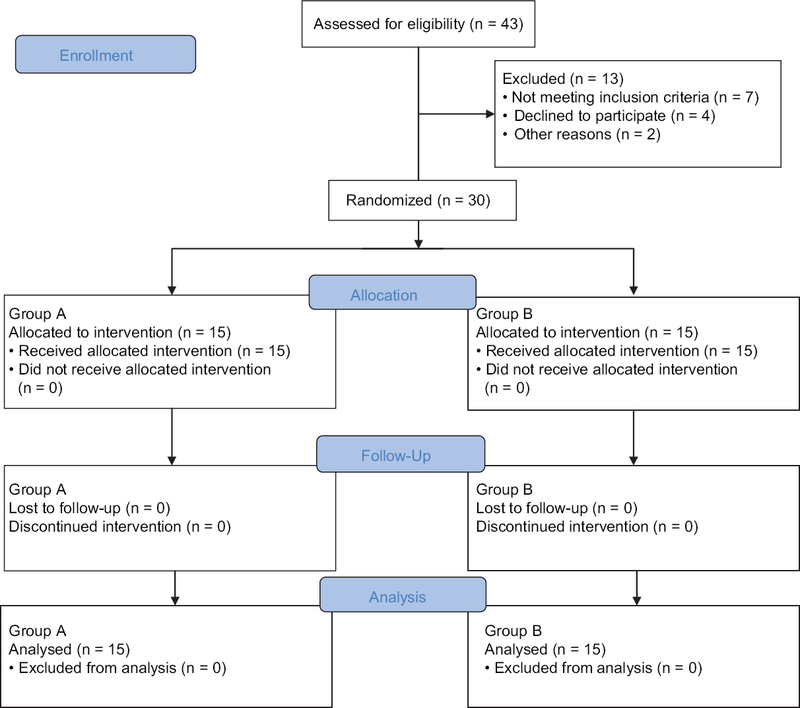 With follow-up in our study there was complete or partial response in 86.7% of patients in group A and also in 80% in group B within 1-month follow-up and it was nearly similar to the results of Özkul et al. as complete or partial response was achieved in 35 (87.5%) and 33 (84.6%) patients in group A and group B, respectively. Moreover, the result was similar to the findings of Spiegler et al. , as at week 4 of follow-up, chemical pleurodesis resulted in a complete response in 14 of 29 (48%) patients, and a partial response in the other 9 of 29 (31%), thus combining to give a successful outcome in 79% of procedures . We conclude that small-caliber tube drainage and rapid pleurodesis was shown to be efficient and demonstrated a good safety profile in treating MPEs. It can be considered as an alternative method for pleurodesis supported by some advantages as regards pain and the hospital stay. Heffner JE, Klein JS. Recent advances in the diagnosis and management of malignant pleural effusions. Mayo Clin Proc 2008; 83:235–250. Gorden JA, Fathi JT. Malignant pleural effusion evaluation and management. Curr Respir Med Rev 2012; 8:314–321. Olden AM, Holloway R. Treatment of malignant pleural effusion: pleurx catheter or talc pleurodesis?. A cost-effectiveness analysis. J Palliat Med 2010; 13:59–65. Akulian J, Feller-Kopman D. The past, current and future of diagnosis and management of pleural disease. J Thorac Dis 2015; 7:S329–S338. Putnam JB Jr. Malignant pleural effusions. Surg Clin North Am 2002; 82:867–883. Sahn SA. Malignant pleural effusions. In: Fishman AP, Elias JA, Fishman JA, Grippi MA, Kaiser LR, Senior RM, editors. Pulmonary Diseases and Disorders. 3rd ed. McGraw-Hill; New York: 1998. pp. 89–98. Antony VB, Loddenkemper R, Astoul P, Boutin C, Goldstraw P, Hott J, et al. Management of malignant pleural effusions. Eur Respir J 2001; 18:402–419. Spiegler PA, Hurewitz AN, Groth ML. Rapid pleurodesis for malignant pleural effusions. Chest 2003; 123:1895–1898. Krochmal R, Reddy C, Yarmus L, Desai NR, Feller-Kopman D, Lee HJ. Patient evaluation for rapid pleurodesis of malignant pleural effusions. J Thorac Dis 2016; 8:2538–2543.